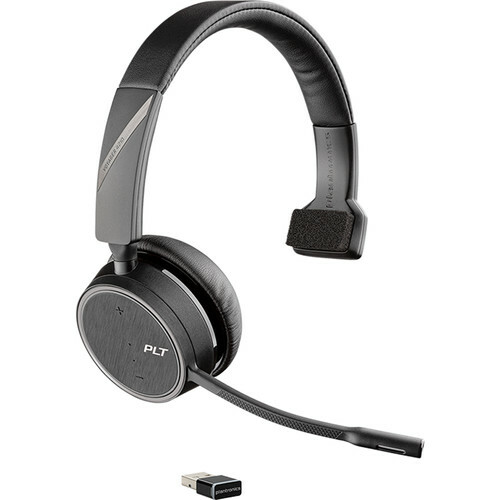 Listen to music or take voice calls without wires with the Voyager Monaural 4210 UC Bluetooth Headset from Plantronics. Featuring a one-cup monaural design and a flexible noise-canceling boom microphone, the Voyager 4210 headset comes with a USB Type-A Bluetooth adapter for connecting to your Mac or Windows PC. With up to 12 hours of talk time, 15 hours of listening time, and a range up to 98' when connected to Bluetooth Class 1 devices, the Voyager 4210 features a dedicated mute button, as well as voice alerts for mute status, remaining talk time, and connection status. A red indicator light on the outside of the speaker lets others know that you're on a call, while a dynamic mute alert sounds if you talk while the Voyager 4210's microphone is muted. The headset has been optimized for universal communication apps and softphones from Avaya, Cisco, Microsoft, and others, and it has been certified for Microsoft Skype for Business. SoundGuard DIGITAL technology helps protect against sound levels above 118 dBA, while an anti-startle feature is designed to detect and eliminate a sudden increase in signal level during calls. Time-weighted average helps to prevent average daily noise exposure from exceeding 85 dBA. Controls on the Voyager 4210 include call answer/end, mute, volume up/down, track forward/back, and pause/play. The Voyager 4210 features two microphones: one with a uni-directional pickup pattern, and another with a MEMS (microelectromechanical systems)-directional design. The headset's folding speakers and included carrying case make it easy to take on the go. Choose the settings to customize your headset with Plantronics Hub, a free app for iPhone, Android, Windows, and Mac. Check remaining talk time, select your language preferences, change feature settings, and customize call and mute notifications. Keep your device up to date with Plantronics Hub over-the-air firmware updates. The Voyager 4210 is supported by Plantronics Manager Pro, a software utility that's sold separately. You can use Plantronics Manager Pro to manage headset inventory, monitor usage, and maintain devices. Supports HSP 1.2 and HFP 1.6. Supports A2DP 1.2 and AVRCP 1.4. Box Dimensions (LxWxH) 8.3 x 7.1 x 2.3"